A new version of this landscape has been published here: Social Media Lanscape 2011. Following last year’s first version of my Social Media Landscape, I am induced to publish a new version to sync with the market’s latest evolutions. And I a not the only one: The Conversation Prism v2.0. This new landscape is now spitted into four main usages (expressing, sharing, networking, playing) and is structured around social platforms which ambition is to cover each user’s needs. 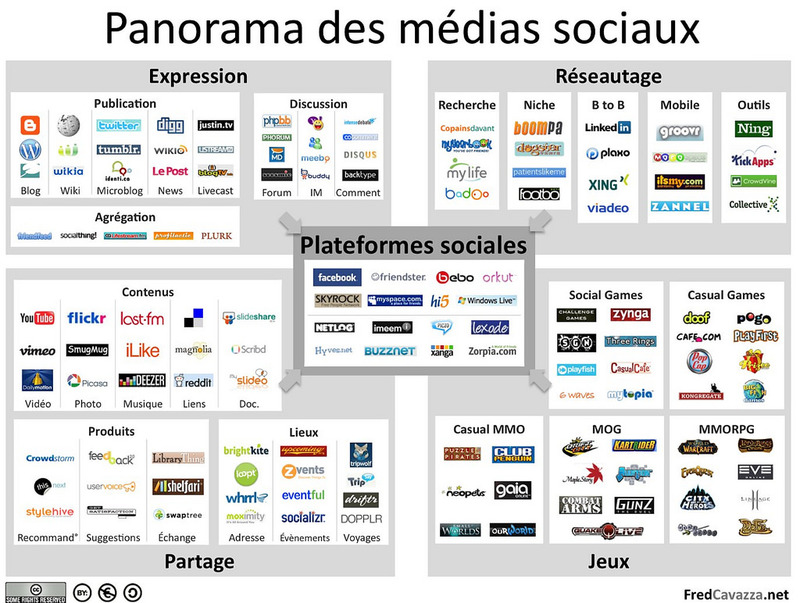 The large size version is here : Social Media Landscape (redux). The various tools and services displayed on this landscape are listed bellow. Aggregation tools (FriendFeed, SocialThing, LifeSteam, Profilactic, Plurk…). Place sharing with tools based on local adresses (BrighKite, Loopt, Whrrl, Moximity), on events (Upcoming, Zvents, EventFul, Socializr) and on trips (TripWolf, TripSay, Driftr, Dopplr). Tools to build an online network (Ning, KickApps, CrowdVine, CollectiveX). Casual MMOs (Puzzle Pirates, Club Penguin, Neopets, Gaia Online, SmallWorlds, OurWorld). At the center of this landscape we will find former social networks, which have evolved to progressively integrate more and more functionalities and morphed themselves into social platforms. The notion of ‘platform‘ is particularly relevant since those network have the ability to host applications (mostly the one you find on the four main usages). We can split social platforms into two groups: The First Generation which have been existing since more then 5 years and gather between 50 and 200 millions of users (Facebook, MySpace, Friendster, Bebo, Orkut, Skyrock, Hi5, Windows Live…) and The New Wave of social players which have a similar offering and a fast growing audience (between 20 and 50 millions users – Netlog, Imeem, Piczo, Lexode, Hyves, Buzznet, Xanga, Zorpia…). I won’t enter in the debate to foresight which platform will grow faster or which will appeal the most to youth audience but I anticipate a rough competition for Facebook which is stile experiencing cash flow problem by sticking to the advertising model while those new social players have integrated micro-transactions and premium membership in their business model. You will also notice in this landscape the discretion of Google and Yahoo! which are ‘only’ represented by services that did not managed to break through the social scene (while being strong references, Blogger, YouTube, FlickR cannot be considered has dominant social platforms). Let’s be honest: MySpace and Facebook decently steal the spotlight from Google and Yahoo!. Wait… maybe not if you consider Google as a being in a much more favorable situation with lower-level services like Gmail (one needs an email to register Facebook, right?) or Google Maps (can you count the number of social services relying on Google mapping tool?). Add to this there current cash situation and it leaves them plenty of time to sharpen their social strategy (Maybe by buying Twitter or FriendFeed, or booth!). The same is true for Yahoo! which can rely on a massive user base (still outnumbering Facebook’s one) and essential social bricks like Delicious, Yahoo! Pipes, MyBlogLog and the promising Fire Eagle. Did I mention Microsoft? Yes, Microsoft, those guys behind Hotmail, MSN and Windows Live. Ignoring them would be a big mistake and Mark Z. was more than happy to welcome them in FB’s capital. From this pint of view, I expect a very thought battle around authentication services (Facebook Connect, Google Accounts…) allowing social platforms to exist outside of their boundaries and to export their members’ social graph. Big players like Google, Yahoo! and Microsoft have to emphasis their legitimacy as historical web players to keep control over their users. I strongly recommend you to pay attention to those different services (yes, there is a life outside Facebook) and I shall meet you next year for a third version! Next Post Twitter a-t-il atteint le point de bascule ? Congrats Fred for this useful tool. Great social-web global view ! It’s clear that all these services will have to articulate around a unique and decentralised social-graph. As for your former version, I’m still reluctant about these kind of presentation of the social web. I don’t think it is very insightful to study social media by categories, as it is impossible de classify most of the tools in a way that everybody aggree (Plurk an aggregation tool ?). Moreover a category doesn’t mean anything : tools in a category doesn’t work the same way (Wikipedia and Wikio ? Tumblr and Twitter ? Plaxo and LinkedIn ?). Yet I admit that – if you know all the limits of this tool – it is really clear and can help people to put a bit of structure in the way they use social media. I don’t aggree on all your choice (Virtual World, something completely different ? – the place you give to gaming plateform – your vision of social plateform) but I understand it and I prefer soemone who put something personal in his analysis than something too neutral and therefor useless. And what about ebay ? Une étude sur l’échantillonnage est en cours, si vous avez déjà utilisé ce procédé merci d’y répondre, cela prendra 3min. @ herbin > Ebay? We are talking about conversations, where are the conversations in Ebay? @ Yann > This chart does not fulfill the ambition to be universally accepted but to be a simplified snapshot of what the social web is at this date. Could you be more specific about the place you would give to gaming platform? Maybe on your blog? whats the status for Second life? No longer big enough to fit in a social media map? @ Jenny > Second Life is big, bigger than ever, but I doubt it can be reducted to a social platform. SL (and virtual worlds) represents such a big potential, such a disruptive innovation that it cannot be compared to other social platforms. This is my vision. Thank you for creating both charts on Social Media networks. I found them most helpful. A great through summary Fred… well done! Ping: Ekklektik » Blog Archive » Overview des réseaux sociaux! Would like to use your graphic with full attribution in a corporate white paper. Would this be possible? Yes Megan, feel free to use this graphic as long as you respect the Creative Commons licence. This is a fantastic overview! Very helpful! Would anyone happen to know how to determine where each of these is hosted (i.e., Canadian versus American servers in the context of the Patriot Act)?